For a few seconds, we are afforded a nice glimpse of the nine-inch tall, odd-looking bird with a most impressive red crest competing in size with the (probably extinct) ivory-billed woodpecker’s. (I’m amazed - can’t recall ever seeing one of these guys before!) The rat-a-tat drilling doubles in intensity as an unseen partner flies in to help out, but in seconds the pair disappears for more bounteous prospects, and silence reigns again in this majestic nook of forest tucked deeply in a “remote” canyon just off Panoramic Highway in “crowded” Marin County, in the purlieus of world-famous Muir Woods National Monument. Having nowhere better to go one recent beautiful, sunny crisp winter day (you couldn’t ask for a more perfect day for an outing), we figure, why the hell not hop over the Richmond Bridge, scoot down the 101, turn off just before the Golden Gate Bridge onto Shoreline Highway (1), and then take the higher mountain vista road, Panoramic Highway, to check out a new approach to the Monument. Something overdue, different, off-the-radar, as-yet-unaccomplished. Is this still possible in the Bay Area, in Marin County? Oh, sure, I’ve been to MWNM “ a hundred times” (viz., twice in 25 years! ); and, of course, I know it “like the back of my hand“ (viz., I could probably get lost there and not be able to name a single trail without consulting my map! ); and, yes, it certainly attracts hordes of hoi polloi tourists (we are all them, ultimately), as an NPS brochure warns “expect large crowds and very limited parking”. Instant, easy access to world-class nature is, to be sure, a double-edged sword -- on the one hand, how wonderful that folks who would never ordinarily be able to get out and appreciate such sights can traverse the boardwalk trails and appreciate the grandeur of “the best tree-lover‘s monument that could possibly be found in all the forests of the world“ (John Muir); but on the other hand. . .there is no other hand. . .and that’s why I’ve always tended to avoid MWN M, because, after all, I‘ve seen coastal redwoods elsewhere on many occasions, and, as Ronald Reagan infamously observed, “if you‘ve seen one redwood you‘ve seen them all,” right? (How lame!). Once again, Gambolin’ Man is at a complete and utter loss (although you’d never know it) to explain how, in nearly a quarter century of hiking around the Bay Area, he’s managed to miss this incredible system of trails off Panoramic Highway leading down into a National Monument, mind you! It’s a bit like being able to sneak in St. Peter’s Cathedral through the back door! 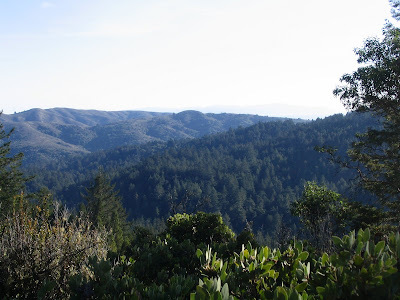 ["... Tamalpais can be seen as the climax of this incomparable landscape at the continent's edge, this place where the Pacific breaches the thousand-mile mountain barrier along the western rim of America." ---Harold Gilliam ] Over and over, I wonder, how is it possible that such a place exists so close to San Francisco, to urban sprawl? Can it be possible to be surrounded by such extensive, protected, natural wild lands, 25,000 acres of them belonging to the State Park, 18,500 in the Mt. 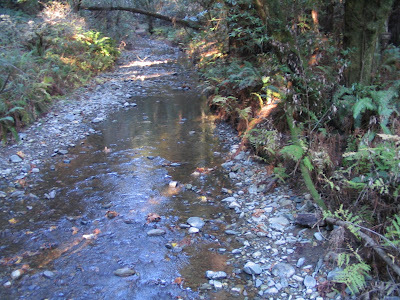 Tam watershed lands, and 75,000 acres, spanning three counties, comprising the Golden Gate National Recreation Area. (Yes, it is possible, and this is the price we pay to live in the Bay Area.) But imagine this: today, the place is practically deserted! On our “drop-down” approach from Panoramic Highway, we encounter precisely zero human beings from the trail head in Mt. Tamalpais State Park to the spec tacular redwood groves of MWNM. Below lies a thickly forested valley, spreading before us to the sea, home to the world-class National Monument, whose towering trees are hiding and lost in a swathe of dense green forest two miles and 800 ft. down the trail. There it’s been for a near eternity, in human terms, today enticing the adventurous explorer to hike the steep, rugged terrain to gain entry to one of California‘s last great magnificent stands of old-growth, uncut redwood forest. And so we begin our descent -- really stoked! 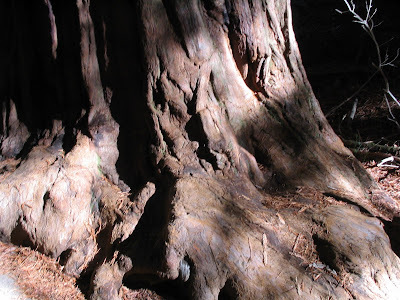 -- on Ocean View Trail, winding down, down, down, into the dark, dank innards of the redwood forest. 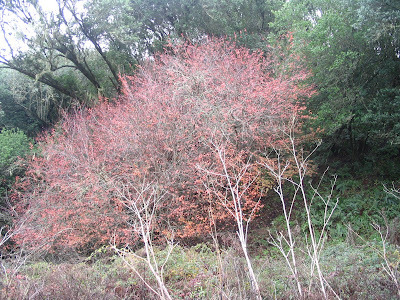 Along the way, losing some good elevation, we pass through distinctive ecosystems supporting a diversity of plants -- chaparral and manzanita predominate on higher slopes, while tanbark oak, live oak, bay and madrone fill the middle zones. 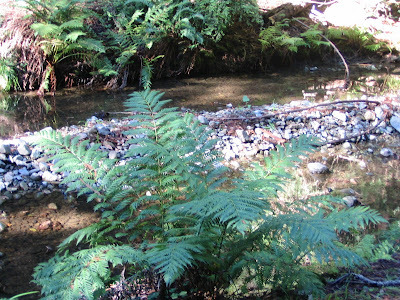 Down on lovely Redwood Creek, in the perennial riparian corridor where salmon swim upstream from Muir Beach to spawn, the giant sequoias reign alongside Douglas firs (no slouches themselves), with a lush understory of giant western ferns, big leaf maples, buckeyes, and red alders; seasonally, dogwood and other bloomin’ beauties abound, and no where on earth is prettier than a Coastal California redwood creek in the springtime. The massive trees found in Bohemian and Cathedral Groves are, on average 800 years old. They soar sky-high-ward, tapering out of s ight with their huge canopy (where, it‘s been learned, entire living ecosystems are supported). You can get a kink in your neck constantly looking up at nature‘s skyscrapers. 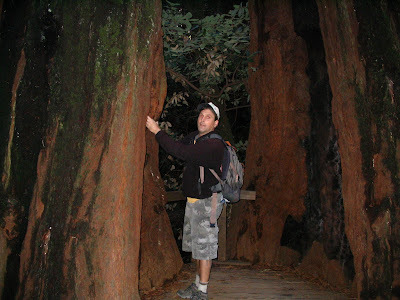 These specimens compare to some of the biggest redwood trees in existence up and down the coast. Unlike (the relatively unheralded) nearby Redwood Regional Park in the East Bay hills above Oakland, the dendro-giants of MWNM were spared the lumberjacks’ axe owing to the area being too rugged and remote; sadly, the stunning trees that once dominated Redwood Regional Park -- the biggest and tallest redwoods at the time, used for alignment by sighting crews in the 17th century from 16 miles out to the Golden Gate -- were, by the early 1860s, reduced to a “sea of stumps” to provide lumber for housing in San Francisco and San Jose. 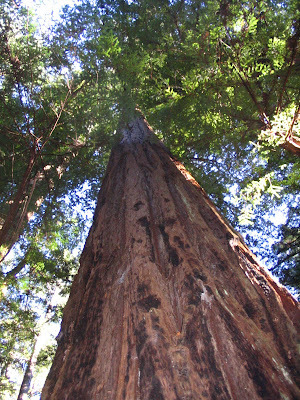 W hat a shame that people then weren’t yet evolved enough to recognize the eternal value and priceless heritage -- rather than short-term gain -- of the greatest redwood forest in California. Well, cynically, if you follow the news or have read Julia Butterfly Hill’s The Legacy of Luna, maybe people still aren’t. 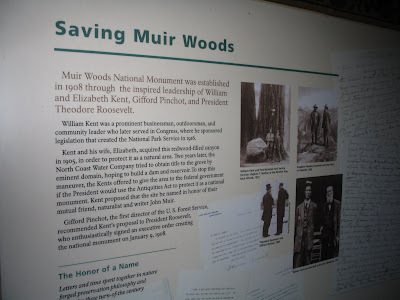 But John Muir, who worked so tirelessly to ensure the salvation of the famous trees of MWNM, proclaimed that “these kings of the forest, the noblest of a noble race, rightly belong to the world . . . We cannot escape the responsibility as their guardians.” Unfortunately, he was about fifty years too late to do anything to help save Redwood Regional Park’s 2000 year old trees from the harvesting saws -- the killing fields -- of a dozen shantytown mills sprung up in the Oakland hills to fell them for profit. 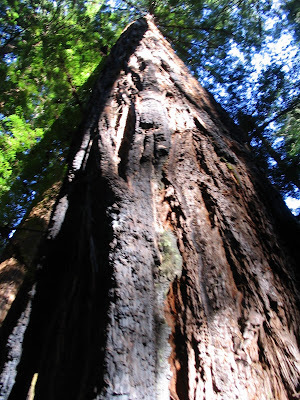 Somewhere down along Redwood Creek is a tree over 250 ft. tall, 14 ft. wide, and 1000 years young. It sprouted around the time Vikings set sail for Vinland, when Toltecs ruled central Mexico, as Europe was emerging from the Dark Ages. It has outlived forty generations of humans. It has survived fire, wind, storm, the axe. Today, it is just middle-aged - will it be alive a thousand years from now, in the year 3006? Will we paltry humans still be around to bear witness? For now, thanks to far-sighted individuals, the redwoods of Muir Woods National Monument and elsewhere stand in defiance of time’s relentless march; they thrive in timeless contrast to humans’ destructive drive to turn a forest into so much “board-feet”; they grow, live and perish - but never really die, for they have ensured a method of perpetually passing along their cloned DNA -- at their own pace and rhythm. From our limited human perspective, they seem to have devised a sure-fire formula for eternity, one which renders all in their exalted presence mere insignificant homunculi. That's quite a nice area. 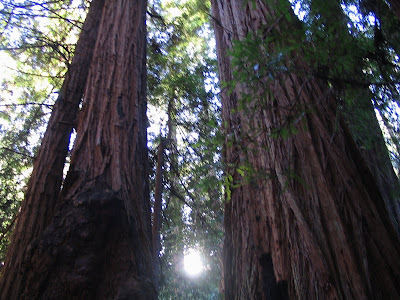 Just imagine how few people had a chance to see the redwoods in past centuries. Photos are is not like the real thing, but photos are still nice. 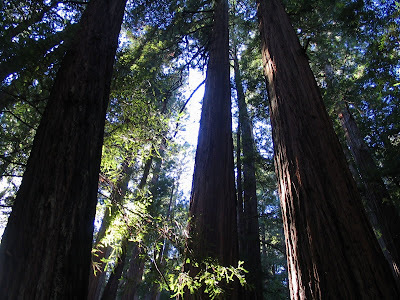 Every time I'm hiking among the redwood trees at Muir Woods I'm so impressed I'm always eager to see them again!! 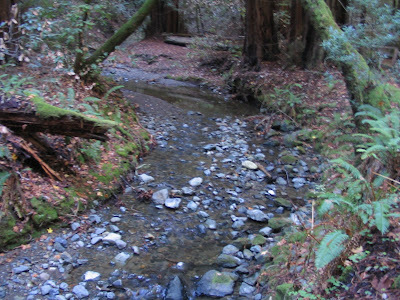 Savvy hikers can minimize parking and crowd issues by getting there early and using the back door trailheads to access Muir Woods.